Curtain rods are stupidly expensive. There. I said it. After deciding that $30+ was way more than I wanted to spend, the husband and I figured out how to make a curtain rod for $5. Yes, I said five dollars. The conduit can be found in the electrical department of a hardware store, and the bell hangers in the plumbing. There are a lot of different hangers you could use for the conduit, some that are even made specifically for conduit, so the bell hangers are only one option. Step Three: Measure your window, and grab a pipe cutter. Cut your conduit to the correct length. Step Four: Introduce conduit to Krylon. Step Five: When all the paint is dry, assemble! Or, if you’re like me, find a big strong man to do it for you while you take pictures. Remember to put the curtains onto the conduit before hanging it. These hangers can be mounted flat on a wall, or upside down. Step Five: You’re finished. Relax. Normally a long curtain rod costs a minimum of $15, so this is a pretty big savings. Aside from that however, these curtain rods rock my socks because they don’t need any center supports, and can handle heavy curtains without bowing and sagging. While I would love to take credit for this idea, it was actually my husband’s. 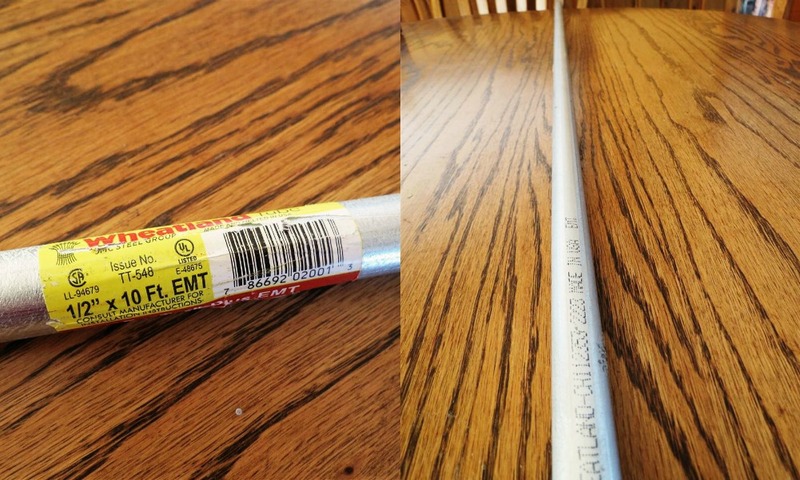 The man flatly refused to pay $15-$20 for a curtain rod when conduit pipe is so cheap. He’s a keeper. I admire you and your husband's ingenuity. Make that I admire your and your husband's ingenuity. Love it – and I have been VERY annoyed that curtain rods won't support my super cozy insulated curtains. Now I know what would work better. Thanks. Good idea, especially with heavy curtains. We've used 2 large screw-in teacup holder hooks and laid a bamboo rod (from a garden center, cut to size) across them. Works well with lightweight curtains. Could do the same with small-diameter pipe. I like it for its price (like your set-up) and for the fact that I can remove the curtains for washing without a screwdriver. Hi ! I've been on your site, redirecting from pinterest, and i'm very glad i did ! Now i found a cheap way to put a "door closet" on all of my playroom shelves (stuva from ikea… 8 little closet, 25€ each door arghhh)Thanks !